Does your wooden dock look old, washed out and weathered from years of hot, direct sunlight and thousands of wet and sandy footsteps – or dog prints? While your dock may still be in good and safe condition for use, giving it a quick facelift this summer can instantly liven up the looks of your waterfront property! You will be very pleasantly surprised to know that Cottage Care Company is a Michigan Dock Washing Company that has several effective solutions to breathing new life into an old dock. All of our cleaners are completely biodegradable and “lake safe”, and are applied at an exact rate for zero waste or environmental pollution. Our custom cleaning services are excellent for demolding green algae or black mold which is commonly found on docks. 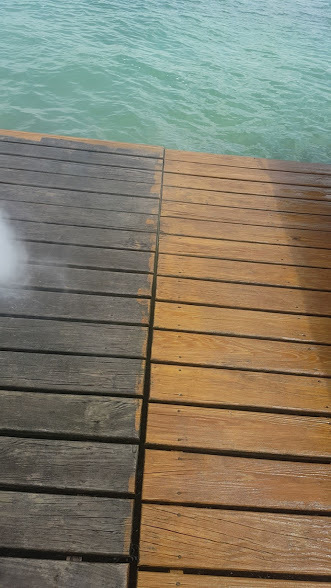 We also utilize environmentally safe stripping agents to remove old stain and apply weathered wood cleaner to brighten the dock wood to its natural color. Be prepared when friends and family ask if you put in a new dock this year, because the results are that spectacular! All of our treatment and sealant options are designed to extend the maximum life of the wood, so this isn’t a project you will need to keep repeating year after year. We also offer a variety of stain and sealant choices to choose from to really customize the look of your dock to better match the uniqueness of your waterfront property. This is a project we have great experience with and can quickly update the look of your dock in only a matter of hours. Weather permitting, we can make your dock look just like new well before company arrives for the upcoming weekend! Please contact us to come out and give you a free custom quote on your dock, and walk through the various wood stains and sealants that are available to you. Does your dock also have a deck with multiple levels or railings? We would be very happy to provide a quality solution to breathe life back into all of your weathered wood!